Many mass media reported yesterday that Bitcon had started moving upwards from its flat line. This is a vivid example of hasty conclusions – how can you talk about upwards movement with the breakthrough of a mere $ 40? We will tell you today what is really happening. After the price left the last week’s triangle via a false breakthrough, the Bitcoin price dropped and made an attempt to test $4,900 level. Thereafter, it slightly recovered and traded flat within the $5,150 – $5,000 range. 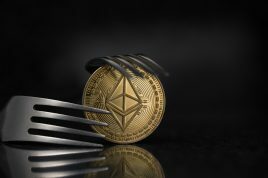 Yesterday (April 15), the price tried to gain a foothold at above $5,200, but failed having punched through $5,000 and then went down to $4,977. Today, all Coinmarketcap top coins moved to the red zone. Bitcoin dropped by 1.46% and is currently trading at $5,104. The only cryptocurrency out of the top 20 that has not lost its value is Bitcoin Cash which grew by 4.23% in the last 24 hours. However, market capitalization decreased by $ 4 billion. On the hourly timeframe, the sideways channel expanded to $5,220 – $5,000 resistance and support levels. The moving averages are above the price. ЕМА50 crossed ЕМА100 from top down signaling further decline. MACD indicator is in the negative area. If the price leaves the channel to move downwards, the support levels will be “round figure” levels of $4,900, $4,800, $4,600 and $4,200. Resistance on the way up will be put up by $5,200, $5,400 – $5,485 and $5,775 levels. The situation of the 4-hour timeframe is not much different. ЕМА50 moving average runs above the price and acts as local resistance at $5,100 level. ЕМА50 at $4,782 level will act as a support. MACD indicator is still in the negative area. The daily chart suggests growth rather than downwards movement. ЕМА50 ($4,500) is tending upwards and runs above ЕМА100 ($4,220), the latter, in its turn, is also reversing in the upwards direction moving support levels higher up. MACD indicator is in the positive area. Thus, the stronger timeframe indicates that growth will soon be resumed. $4,500 level that used to be a strong resistance, now acts as a strong support. 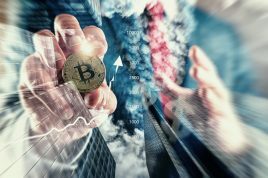 Nowadays, analysts are of differing opinions on the forecasts concerning the crypto market future. 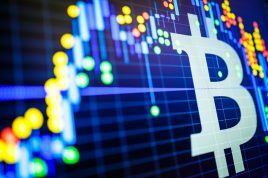 Analyst Lisa N. Edwards, for example, believes that Bitcoin will continue to grow in the next few days as suggested by the rising parabola pattern recorded by her https://twitter.com/LisaNEdwards/status/1117589262541529088. It this pattern continues, Bitcoin has a chance to rise to $7,000 within the next few months. Other analysts highlight overbuying. 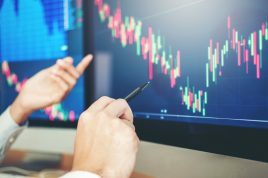 For instance, Omkar Gorbole, a CoinDesk analyst, believes that it was the overbuying that did not let the coin reach the $6,000 level. He does not rule out a fall to $4,625, if the price does not manage to hold onto the $4,912 level. In the weekly digest which will be posted in our blog tomorrow, we will review the main market news. In the medium term, we are expecting levels $5,770 and $6,130. The movement toward them will probably be preceded by a corrective decline which will allow for buying at great prices from support levels all the way down to $4,500. If you have pending orders placed, we would advise you to just enjoy this week – go out for walks or spend it doing other things you need to do.